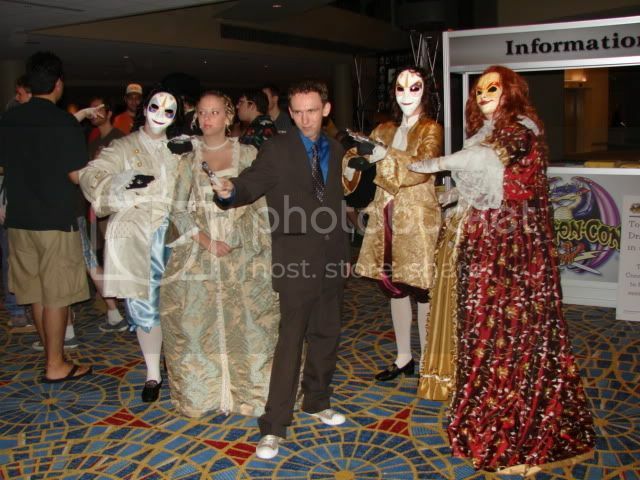 This is a Robe a la Francaise that was put together for Dragon*Con 2008. More specifically, for a character from the new series of Doctor Who, the "Clockwork Droids" from season 2. However, it's the same kind of dress seen in Marie Antoinette, Affair of the Necklace, Dangerous Liaisons and other such Rococo/Baroque period movies. I wanted to do a costume that was big and floofy, and I also wanted to use fabric I already had in my stash. I've wanted a robe a la francaise for years so this allowed me to do all I wanted to, and more. 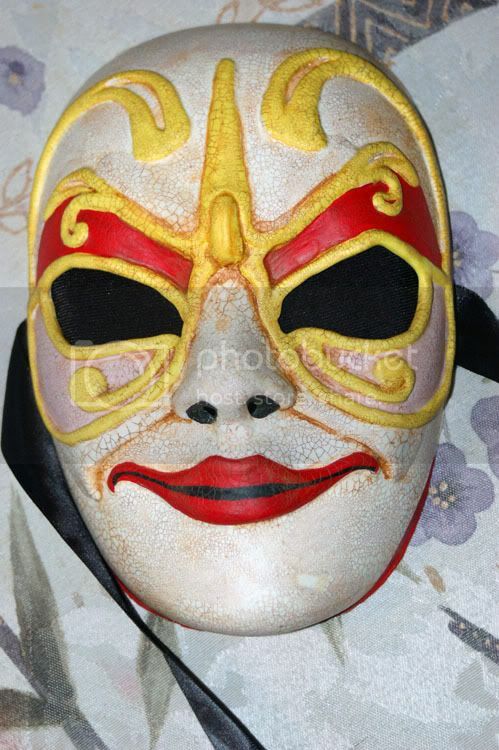 Because there are several of these lovely "ladies" and they all wear different dresses, I could do what I wanted to as far as fabrics and colors went, as long as the mask was right because they all wear the same mask. 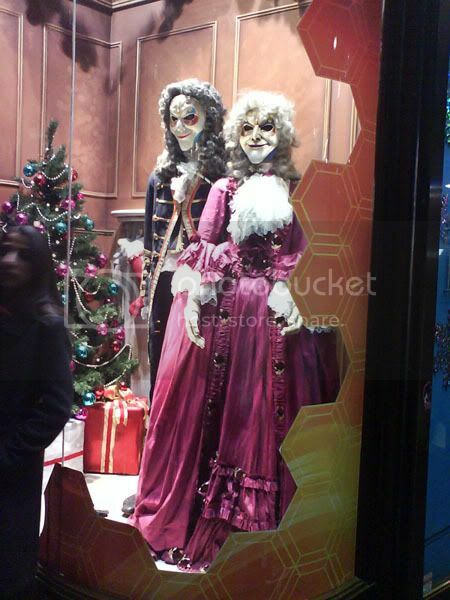 Oh how I love artistic licensing when it comes to costumes! I had about eight yards of embroidered silk taffeta, and four yards of gold faux silk taffeta and decided to use them for the gown. I bought the fabric maybe six months ago with no real idea of what I'd use it for. I just knew it had gone from $50 a yard to $4.50 and I really, really liked it. The gold ruffled trim along the bottom of the petticoat and down the front of the dress was made from the same gold taffeta as the petticoat, by way of cutting three inch wide strips and pinking the edges with a special blade on my rotary tool. I used Simplicity Pattern 3637 for the sleeves and most of the bodice, and drafted my own pattern for the stomacher, sack back, and skirt. The only thing I ended up purchasing for this dress was about 8 yards of white gimp braid with a white velvet ribbon wound through it, knee high stockings, and thread. It took me about three weeks, something like that, off and on. I could have gotten it done sooner, but I took my time and actually had a lot of fun putting this together. Shift: Plain Cotton something or another that I threw together I don't know how long ago. I'm glad it can't be seen because it's hardly worth presenting. Needs to be remade like I don't know what. Corset: Actually a Tudor corset I've had around for a while as well. I decided to use it because my 1750's stays aren't 100% done and it had the same boned tabs, as well as the same shape as the rococo stays. I've seen historical evidence of women using stays without straps during this period so I decided it wasn't such a huge deal. Side Hoops with built in Pockets: Sort of like the Shift, I threw these together I don't know how long ago. Not historically accurate in anything beyond the shape. They work though, held up the skirt and didn't get in my way. Petticoat: Faux gold silk with ruffled edge, and pink gathered self-trim along front half of skirt. Drawstring waist with a separate string for front and back. Silts in sides for easy access to pockets. Stomacher: Drafted from my corset. Boned in a fan pattern and attaches to corset with ribbon ties. I realize that it's more historically accurate to use pins, but I needed to be able to get myself in and out of this quickly and make sure that it was secure. 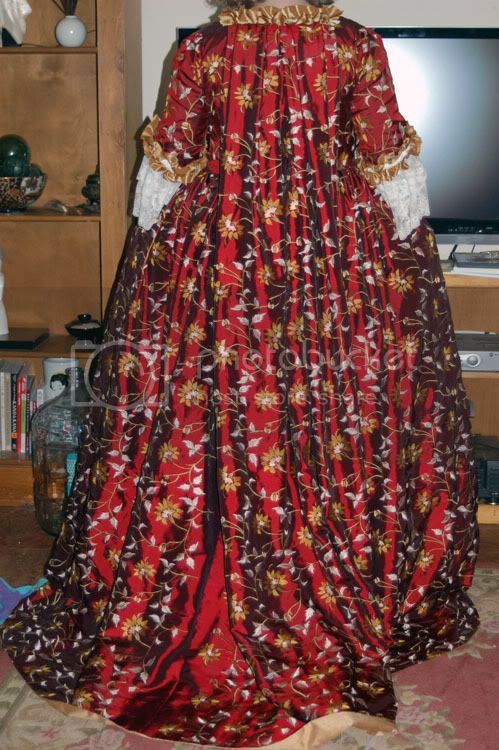 Stomacher also has the eyes to the front hook and eye closer of the gown. I made the bows out of white silk I had left over, and used over sized gold tone/fake opal buttons to accent the bow centers. Gown: Bodice from Simplicity pattern 3637. 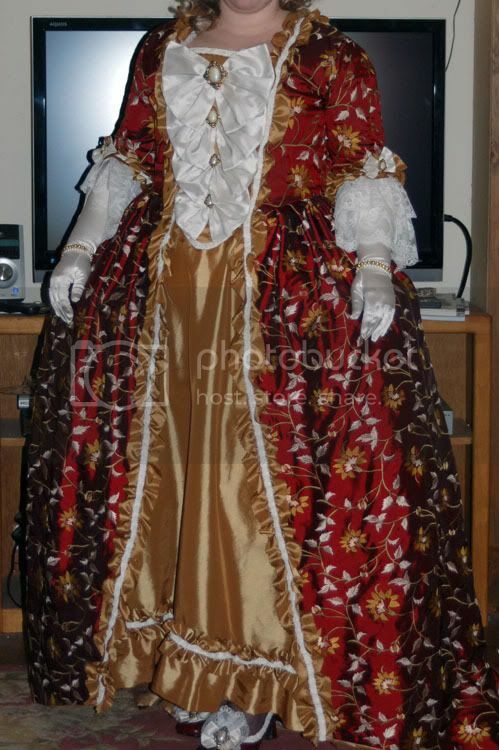 Made from dark red embroidered silk taffeta I had bought with no real purpose in mind. Train of about one foot in back. Bodice and sleeves lined in left over colored cotton from my scrap bin. Sleeves edged in same pinked gold trim and white velvet braid, accented in bows/buttons that match the stomacher. The lace on the sleeves is antique lace I found in my stash. The skirt is hemmed by way of a 6" deep facing to keep the curve in the hem flat, and protect the edges of the skirt as it does drag a bit in the back. Front edges have the hooks to the hook and eye closures and attaches to either side of the stomacher to close the dress. Shoes: Purchased from Ross I don't know how long ago. Same color red as the dress, I made a cockade out of matching lace on the shift, then added a bow/button and glued on the left over of the white braid. Probably my favorite part of the costume. Mask: I didn't make this. My friend Mary who does incredible work made this for me. She's also the same person who made the wire mask for my Blue Corseted Ballgown. She used a store bought plastic mask form, and built up on the cheeks, nose, and the swirls around the eyes with Epoxy sculpt. Was then painted with acrylic paints and finished with a crackle medium. Is worn by way of an elastic band that can go over or under the wig. The eyes are covered with a sheer black stretch material so I can see out, but still have my face fully covered. There are some things on this costume I'd like to tweak here or there, but as of right now it's done, quite wearable and actually very comfortable. Some other fabulous costumers I found at Dragon*Con on Sunday Night, dressed from the same episode of Doctor Who as myself. And here are some pictures of my dress, the shoes, and my mask. That must have taken forever! Its lovely! My friend just came back from DragonCon and I saw some of her pictures... some of those costumes are amazing! omg thats beautiful! i love that episode,its gorgeous! Wow, that dress is amazing! And the shoes are perfect! Yup, definitely not hipster enough for Craftster. Gorgeous Job! I love the dress. I love that episode! Oh wow. That is so well done! That's one of my two favorite episodes, and you really did it justice (i just can't decide between this one and Blink...). 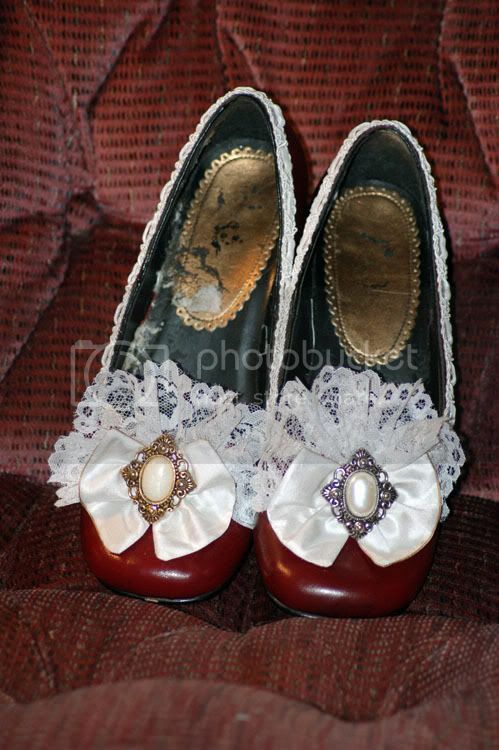 I love all the detail, especially the shoes! I'm stunned and amazed. That is one of the very best con costumes I've ever seen. Just fabulous. It looks great on you. I adore that group picture! You did an amazing job on your outfit, the fabric is gorgeous! BTW...Doctor Who rocks my chuck's off! Why doesn't evolution work with embroidery kits? Amazing good work! And what serendipity to find that crew at Dragoncon! That is a lot of serious work! Awesome job! If your site doesn't support Firefox, Firefox users won't support your site!